If you think the Spiderman doesn’t know his v-twins, think again. 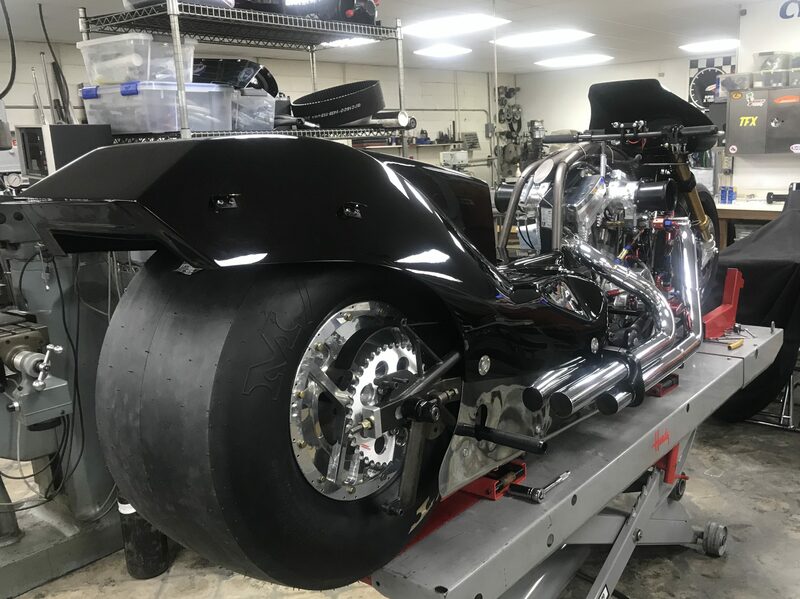 The world’s quickest Top Fuel Motorcycle drag racer Larry “Spiderman” McBride and talented tool and die maker, brother Steve, are known as meticulous, perfectionist motorcycle builders, whether they are constructing an inline four cylinder or a v-twin. The McBride’s reputation of excellence is what drove former AHDRA Pro Fuel champion Tim Kerrigan, formerly of Red Line Oil, to contract the Spiderman for a total overhaul of an outdated Nitro Harley. Kerrigan and McBride have teamed up on builds in the past. It was a way to reconnect with a popular segment of the sport for both parties. The Red Line Oil Nitro Harley in the shop of McBride, ready for an overhaul. The motorcycle has not been raced in more than 15 years. Major updates were needed to bring this machine up to par. It has been since 1995 that the Spiderman campaigned an Overkill, Nitro Harley with Fred Buckley and Quick Way Trucking. The passion for Nitro Harleys for the McBride’s and Kerrigan was still as strong as ever. A total of about 350 hours were put into the machine to usher it back into the modern era. The bike came all the way down to the frame at McBride’s Newport News, Va. Cycle Specialist headquarters. McBride dissected and freshened up the 175 cubic inch PRP motor, adding all new bearings and new pistons. The Spiderman also reworked the cylinder heads with a valve job. McBride is pleased with the final product and is appreciative to have a deep rolodex of Harley friends who helped on many occasions. McBride said the next step is for Kerrigan to go get his NHRA license so that he can start entering select events. The Spiderman is optimistic on the performance potential of the revamped, high-gear only, Orangeburg Cycle Bill Furr chassis. He also recognizes the limitations of older motorcycles compared to brand new ones. McBride says with this project complete, he and his brother can continue the new four-cylinder Top Fuel builds for Jimmy Brantley, Dave Vantine and Athol Williams, along with preparing their own machine for the upcoming Man Cup opener, April 6-7. For all the continued support McBride thanked his primary sponsors; Trim-Tex Drywall Products, Pingel Enterprise, Drag Specialties-Parts Unlimited, Final Swipe Merchant Services, Web-Cam, APE and Kibblewhite Precision Machining.